Salt has become one of the largest crusades for food paternalists, joining trans fats and high fructose corn syrup as supposed causes for concern. The Food and Drug Administration has begun to look at regulating the amount of salt in "processed" foods, and they're being cheered on by progressives. ThinkProgress' health reporter Sy Mukherjee asked "why can't the FDA do more to crack down on these additives? ", and lamented that foods generally recognized as safe cannot be so easily controlled by regulatory fiat. Media Matters noted the "positive effects" from diets with reduced salt and said that those who disagreed with FDA regulations are waging a "war on health." The Center for Science in the Public Interest, a leading food paternalist group, calls salt "probably the single most harmful substance in the food supply." Indeed, the Centers for Disease Control recommends a daily salt intake of 2,300 mg when Americans consume on average over 3,400 mg. 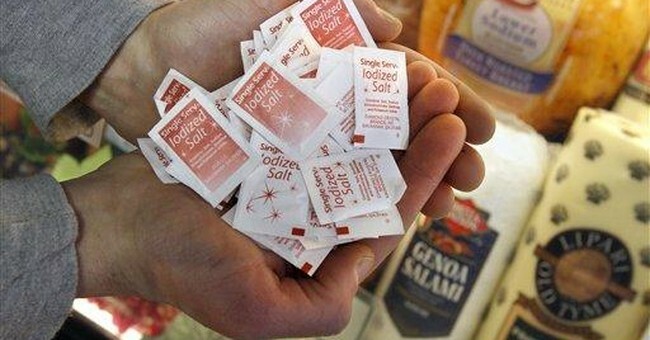 Some studies have shown that reducing the salt in one's diet can lead to better health outcomes. Now, the CDC asked the Institute of Medicine of the National Academies to review the available academic literature. The findings won't be welcome to food paternalists. Many of the studies linking decreased salt consumption with better health outcomes aren't up to par. "Overall," the report reads, "the committee found both the quantity and quality of relevant studies to be less than optimal." Many of these studies were conducted on populations around the world that bear little resemblance to Americans. The American diet, for example, is actually relatively low in salt compared with others. It's entirely possible that the amount of salt in the average American's diet carries no adverse health outcomes with it. Indeed, on studies that are relevant to Americans, there's little evidence to support FDA regulations that would limit salt in our food. "The evidence from studies on direct health outcomes is inconsistent and insufficient to conclude that lowering sodium intakes below 2,300 mg per day either increases or decreases risk of CVD outcomes (including stroke and CVD [cardiovascular disease] mortality) or all-cause mortality in the general U.S. population." So no relationship between lowering salt in the American diet and health outcomes. What about at-risk populations? This time, the committee found "no evidence for benefit and some evidence of risk of adverse health outcomes" for "disease-specific population subgroups." This is a strong rebuke to the CDC's current guidelines and the progressive hysteria surrounding salt. The FDA controls a lot of America's agricultural policy, but a lack of regulation is not a problem the agency suffers. Indeed, the FDA is, if anything, too cautious in its mandate to protect the public health. (Take a look at their record when it comes to the drug approval process, for example.) No need for progressives to worry - the regulate-first-ask-questions-later approach is the default position for most government agencies. It's certainly possible to have a dangerously high amount of salt in one's diet. It's possible to have a dangerously high amount of nearly anything in one's diet. There's very little evidence that salt poses a unique danger to Americans at the moment. So will progressive food paternalists actually listen to what the scientific literature is saying this time and pull back on the anti-salt campaign? Will the FDA? We won't hold our breath. But we might stock up on some oversalted potato chips.